Following the challenge from Amy Johnson Crow to write a post weekly, 52 Ancestors in 52 Weeks, here is the 51st ancestor, Benjamin CLAP, 1710-1793, in Scituate, Plymouth, Massachusetts. Only one more to research and write as I did an extra one in order to have the Christmas season free for family! I have very little evidence on this ancestor, and am not entirely convinced he belongs here, but... some records seem to indicate he's the right man. Benjamin would be the 5th great-grandfather to my ex-husband through his mother's RICE line, 6th great-grandfather to our children. Note that Clap is sometimes spelled with two Ps. I only know his name in relation to a daughter, Abigal [sic], who married Joshua Baily in Scituate. There appears to have been a second (Lieut.) Benjamin Clapp born and buried in Stoughton MA, about 23 miles west of Scituate. That particular Benjamin Clap is definitely not "my" Benjamin. I can keep those different families separate because of several of the children. Massachusetts Vital Records, Marriage Records, give names and details, but no images (Ancestry, Family Search), however the details help to distinguish the several Clap/p and Baily families in the region. Massachusetts Birth records for Scituate show Benjamin CLAP born 26 April 1710, of father Joseph CLAP (no mention of his mother). He apparently had a sibling named Joseph Clap (jr). Note: the significant gap between the 2nd and 3rd child; there may be missing children, or other reasons for this gap. I have not looked for children/marriages for the two boys, or other children, to date. The 1790 Census for Scituate (5 pages, 3 columns) states there were 2856 persons in the village, and I was able to find only one "Benj Clapp". Other Clapp names in Scituate on the1790 Census were Augustus, Constant, David, Desire, Dwelley [truly - clear as a bell], Elijah, James, John, Joshua, Lewis, Samuel, Sarah, Silvanus, William, and Zilpha. Augustus, Zilpha and Benjamin were all listed beside each other, with Lewis a few lines above. With probate records, land records, and more, I might be able to find out who belongs with whom, but that can keep for another research trip through Massachusetts early records. So far, it's clear that Augustus Clapp was Town Clerk for a period of time in the early 1800s, but I haven't looked for his parents. Hmm, in 1793, he shows up on a Plymouth county MA Probate Docket for Benjamin Clapp of Scituate. Clearly there is some sort of relationship here. It's slow going browsing through the MA estate files and probate dockets, not impossible, but needs careful searching. It's also important to note that there are several Abigal-named women who married a Bailey in Scituate: one married a John Bailie 19 Feb 1700, another married a Willliam Baily 24 Dec 1741, and one married Joshua in 1756 (our ancestor). Massachusetts registers for Scituate show that in 1793, sometime before Oct 21st, Benjamin Clapp died. His name is third in the list for deaths in 1793; no actual 1793 dates were written down on the register until late in October, for some reason. The previously mentioned (Lieut.) Benjamin Clapp in Stoughton MA apparently died 11 Oct 1793. A number of family trees state that my Benjamin who married Grace died 11 Oct 1793 - so I believe there has been some ongoing confusion between the two. 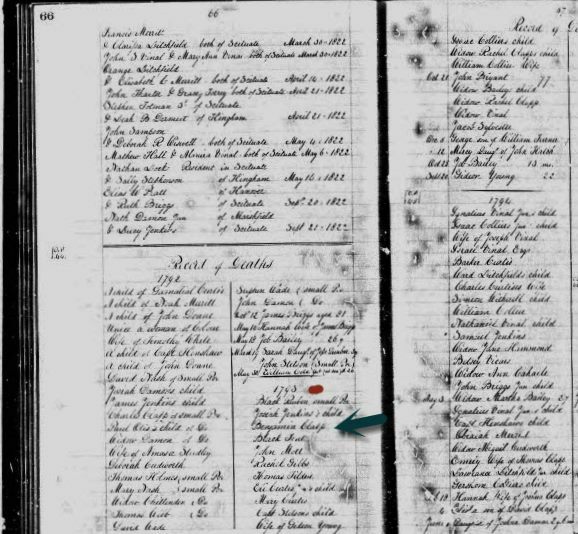 From the hand-written register, it looks significantly more likely that Benjamin died in the first month(s) of the year 1793. As is usual with this challenge, I have so many records to search, for several significant people. I have now found - I believe - that Benjamin's father is Joseph, and Joseph's father is Samuel - who had 8 or 9 children! Busybusybusy - my brain is churning. I do love trying to read very old hand-written registers, as the cleric tries to squeeze everything on the paper, yet save room for more details of other children. If you have further information on the Scituate MA ancestor, Benjamin CLAPP, I would be quite thrilled to read more details. I'll do more research of course, but a few more bread crumbs would be very welcome! You may contact me via calewis at telus dot net or in the Comments below. Thanks for stopping by.